What is the secret formula for sustained growth? Analysis of the corporate growth of 1,850 companies by Bain Consulting revealed that the ‘most profitable growth comes when a company pushes out from its core into an adjacent space’. Adjacency-led growth sounds desirable but how do you move beyond your core business without reaching too far, without having to learn something completely new? A good first step is to look at your own strengths, and this is where an objective assessment can help, as it is easy to take something we excel at for granted. For example, a company may be brilliant at logistics, at coordinating parts and services from a variety of vendors and getting them where they need to be. They may assume that this is something all successful companies do exceptionally well and miss an important strength that could be an advantage in different contexts. Maybe your strength is a technology that is currently deployed in a particular industry, but your knowledge of that technology and how to apply it can solve a critical problem in another industry sector. Most growth is actually based on an existing strength, such as introducing an existing technology into a new market sector or geographic area; investigating new distribution channels; or addressing new customer segments with the creative use of a proven product or technology. This probably is not a big surprise, but often companies fail as they chase trends or mimic what has worked for other companies and neglect to look outside of their own organization to gain different perspectives. By adopting several different viewpoints you can challenge existing boundaries and open your business to new opportunities. This can include: assessment of current market position and business model; reviewing current capabilities to put your strengths in context; developing new insights through better understanding of customer needs and behaviors; evaluating the impact of evolving trends such as regulatory issues or technology developments and testing and defining new opportunity spaces. Through a structured approach it is possible to identify and quantify the relative value of adjacencies and de-risk the growth strategy. 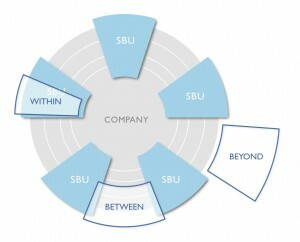 Developing a robust and repeatable formula for exploiting adjacencies was shown by the Bain Consulting research to be a common characteristic of successful companies. So if you are wondering where the most profitable adjacency-based growth opportunities are for your organization, then you will be interested in reading our white paper: Are you maximizing your growth opportunities? This entry was posted in Blog, News and tagged Adjacency-led growth, adjacency-led innovation by rachel. Bookmark the permalink.